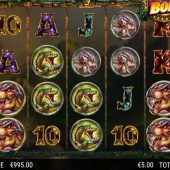 King Kong Fury slot from NextGen Gaming sees Kong go up against the prehistoric creatures, namely dinosaurs on the infamous Skull Island. King Kong has enjoyed a bit of a renaissance in recent years, with a flurry of blockbuster movies, video games and of course slots. There has been Amaya’s King Kong Island of Skull Mountain, Playtech’s Kong, Crypto’s King Kong and the more playful King Kong Cash from BluePrint. This particular game is beautifully illustrated and is packed full of sounds and animations that are right on the money. So will this chest-beating beast be able to deliver us a healthy balance or will we be wishing he had remained deep in the jungle? 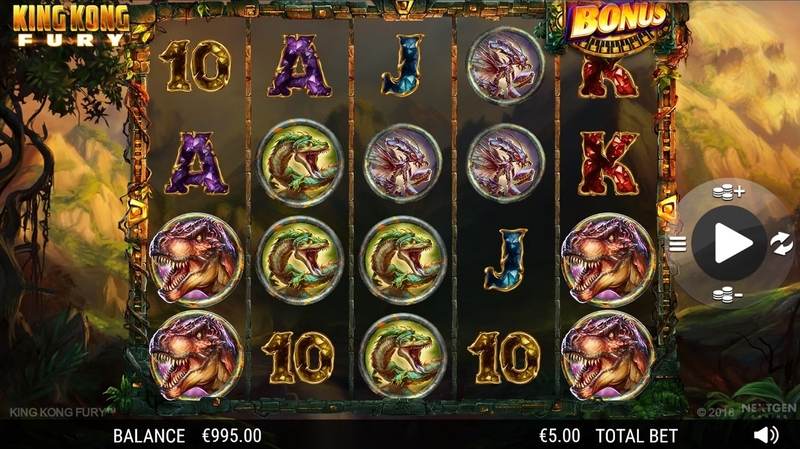 There are 5 reels, 4 rows and a total of 50 paylines in King Kong Fury. Top paying symbol is the Tyrannosaurus Rex, which will reward 10x your bet for 5-of-a-kind. Other symbols, such as triceratops and pterodactyls, snakes and bugs offer lower pays and are followed by the A-K-Q-J-10-9. Kong is the Wild and will replace all symbols except the bonus scatter. You will only find the Kong Wild on the middle 3 wheels. A random feature that can occur in both the base game and bonus feature is the Lightning reel. A big thunder bolt will cross the screen adding up to 15 matching picture symbols to the reels in random positions. If you hear the chant of Kong then you can expect up to 12 Wilds added to the reels, potentially creating some new winning opportunities. King Kong Fury comes with a free spins feature which is triggered when you land the bonus scatter (Anne Darrow) on reels 1 and 5. To start with you will get 4x your stake. You then spin the stature wheels to collect 3-10 free spins, which are multiplied by the wheel on the right 3-10. So there is a possibility of 100 free spins (10x10). As well as the Lightning reel and the Kong Call there is also an added feature called the Raging re-spin. Should you get a full stack of Wilds on any of the 3 middle reels then it will be held and a re-spin will take place. If any more stacked Wild reels appear then more re-spins will take place.